Discovered by Christopher Columbus in 1502, Cost Rica was a Spanish colony from 1522 until independence in 1821. Columbus named the territory Nueva Cartago (New Carthage), and the name Costa Rica was not generally used until after 1540. Bartholomew Columbus attempted the first settlement, but was driven off by Indian attacks, and the country was not subdued until 1530. After centuries as part of the Spanish Captaincy-General of Guatemala, Costa Rica was absorbed into the Mexican Empire of Augustin de Iturbide from 1821 to 1823. From 1823 to 1848 it was a constituent state of the Central American Republic. Established as a republic in 1848, Costa Rica adopted democratic reforms in the 1870' and 1880's. today Costa Rica remains a model of democracy in Latin America, although in common with most of the hemisphere, its economy is in stress. According to the CIA, Costa Rica is a Central American success story. Since the late 19th century, only two brief periods of violence have marred its democratic development. Although it still maintains a large agricultural sector, Costa Rica has expanded its economy to include strong technology and tourism industries. The standard of living is relatively high. Land ownership is widespread. 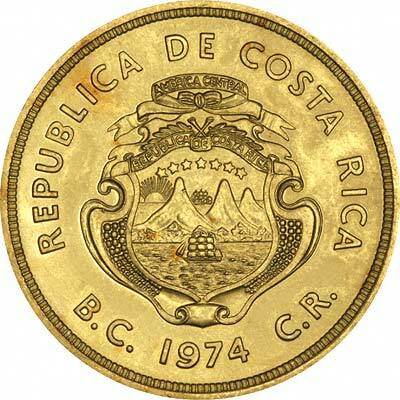 Costa Rica has had four major coinage schemes. From the formation of the republic, there were coins using the Real and Escudo system. One (1) Onza = 8 Escudos = 16 Pesos. One Peso = 8 Reales, therefore One Onza = 64 Reales. A decimal coinage was introduced in 1864 with 100 Centavos equalling 1 Peso. In 1897, there was a coinage reform, with 100 Centimos equalling 1 Colon (plural Colones). To anglophones, this denomination will sound like a strange name for a currency denomination! In 1920, there was a further currency reform, but using the same denominations. 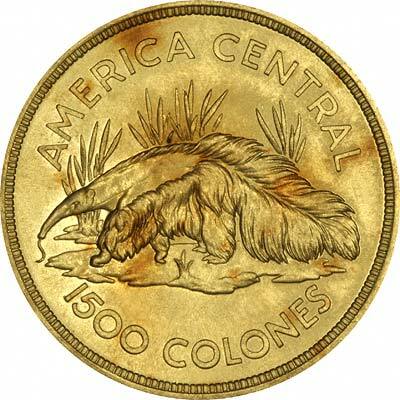 Cost Rica has only produced limited quantities of gold coins, and these remain somewhat scarce, certainly compared with the plentiful gold issues of other countries, such as the British Sovereign. For silver and base metal coins of Costa Rica, please look at our original Chard Coins website.